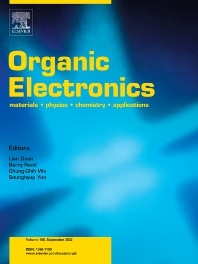 Organic Electronics is a journal whose primary interdisciplinary focus is on materials and phenomena related to organic devices such as light emitting diodes, thin film transistors, photovoltaic cells, sensors, memories, etc. Papers suitable for publication in this journal cover such topics as photoconductive and electronic properties of organic materials, thin film structures and characterization in the context of organic devices, charge and exciton transport, organic electronic and optoelectronic devices. Organic Electronics provides the forum for applied, fundamental and interdisciplinary contributions spanning the wide range of electronic properties and applications of organic materials. A Letters section is included for rapid publication of short articles announcing significant and highly original results. Keywords: organic electronics, light-emitting diodes, solar cells, thin film transistors, sensors, memories, organic semiconductors, hybrid semiconductors, optoelectronics, charge transport.